Everyone who checked the standings this morning was treated to a truly rare sight. Every team in the AL and NL East was above .500. For this to occur over 50 games into the season is astounding. Fans of teams in other divisions tend to get upset by the seemingly uneven coverage that the East teams get, but it's times like this that make it difficult to not step back and see it as completely justified. The AL and NL teams are just better. The East Coast Bias doesn't create this, although it is definitely intertwined. Some of the largest media markets are represented by teams in the East divisions. Larger media markets equals more money, more money buys more talent (shutup Rays fans), and talent gets wins. Never has the apparent divide seemed more pronounced though, and I expect it to stay this way for quite some time. Anyone who told you at the beginning of the season that they thought the Mets and Orioles would be at the top of their divisions and the Red Sox and Phillies would be at the bottom is either a liar or a fool. Those teams will eventually regress closer to their true talent levels, especially as more games are played within the divisions, however their current positions mean we could see a lot of .500+ teams for a long time to come. The ZiPS projections released last week put the Orioles at the bottom of the AL East at the end of the season with a 81-81 record and the Mets as the only team under .500 in the NL East at 77-85. If teams maintain a linear pace between now and their projected records, the Mets shouldn't expect to reach .500 until they're 49-49. That's 48 games away! The AL and NL East teams are just beating up on the rest of the league. The AL East is 40-25 against the AL Central and 32-27 against the AL West. Similarly the NL East is 48-35 against the NL Central and 39-26 against the NL West. Out of the 20 matchups the East teams have against teams from other divisions only 6 have losing records and 3 of those are by only one game. That isn't all that different from last year when the East teams went 410-334 against teams in their league outside of their division. Only this year most of the East teams got even better. I think this makes it obvious why I bitched about the new playoff format a few months ago. A whole bunch of these teams are going to get screwed. Due to all the intra-divisional games it's even possible that the second wild-card comes from a team outside the division with a cushy schedule. if the playoffs were to start today the Indians would have the second wild-card spot. Forget the East Coast Bias. The east coast is getting screwed. There are maybe two other teams in baseball who could even compete in one of the East divisions right now but my guess is that somewhere between four and six teams from outside of those divisions will be making the playoffs, two of them with a guaranteed spot in the divisional round. 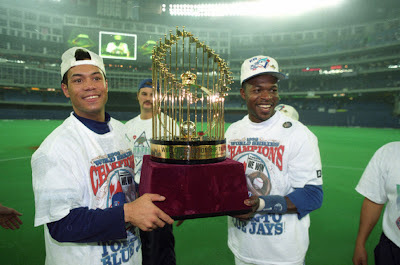 At least Jays fans will be treated to more meaningful games between now and then. There is a moment I love that comes from seeing an amazing performance by the away team. It's the moment when fans at the game realize that they are staring into the gaze of history and they stop cheering for the home team and instead start cheering for the accomplishment. In that moment, instead of just cheering for laundry, everyone becomes united as a fan of the sport. We witnessed this two weeks ago when Mariners fans cheered for Philip Humber's perfect game and we saw it again last night as 11,263 Oriole fans game Josh Hamilton a standing ovation as he trotted around the bases for a fourth time. 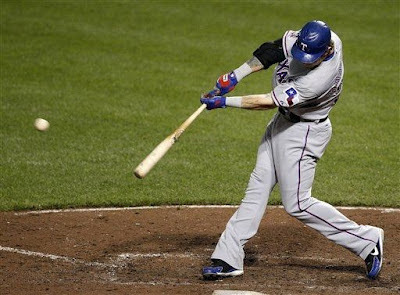 Last night Josh Hamilton became only the 16th player to hit four home runs in a game. It's a feat rarer than the perfect game which has now been accomplished 21 times. All perfect games are similar, the stat lines read almost identical. Sure Sandy Koufax got 14 Ks while Dallas Braden only got 6, but when all is said and done it's just minor semantics. The goal is to get all the players out, how it's done is a little irrelevant. The four home run game can be much more unique though. The number of at-bats it took to do it, the result of other at-bats, and the influence of the home runs on the game are completely different from game to game. In order to hit four home runs in a game a player needs to bat at least four times. It sounds obvious, but if you're batting in the cleanup spot or lower in the lineup, you're going to need help from your teammates just to get that fourth at bat. The better your teammates are, the greater your odds are of getting enough at-bats to get the fourth homerun. When Carlos Delgado hit 4 HR in 2003 he had only 4 PA to do it in. Every other player who has accomplished this feat has had at least 5 PA. One wonders what Delgado may have been able to do with another chance to hit. In fact there have even been three occasions where a player has hit 3 HR in a game on only 3 PA. Bo Jackson did it in 1990 but was lifted from the game after the third HR. In 1966 Art Shamsky entered the game for the pitcher in the 8th inning before hitting 3 HR as the game went 13 innings. And in 1951 Del Wilbur hit 3 HR out of the 8th spot in the lineup, but since his 3 solo shots were the only runs scored that game, he never got a chance to try and make history. Fortunately for Hamilton, he was able to get a 5th PA in to get that final home run. There have been 149 events of players getting 3 HR in 4 PA who were never able to come to the plate a 5th time, although only once did one of those players also have a double (Merv Connors, 1938). Hamilton was able to get that 5th at-bat though tying him for second with Joe Adcock with 18 total bases, one behind Shawn Green's 19 from his 4 HR day, although Shawn Green needed a 6th PA and a single to make it happen. Hamilton also became only the 5th player (Delgado, Green, Adcock, Colavito) in the 4 HR club to get on base in all of his appearances. In the end, Hamilton was presented with a great opportunity and took full advantage of it, being as perfect as any batter could possibly be. A pitcher's possibilities for perfection are limited to 27 outs (unless we get dueling perfect games) but a batter is only limited by how often he can get up to the plate. We can only compare batters to those who have come before him and Hamilton's performance last night stacks up against any of them. It probably doesn't hurt Hamilton that it's a contract year too.